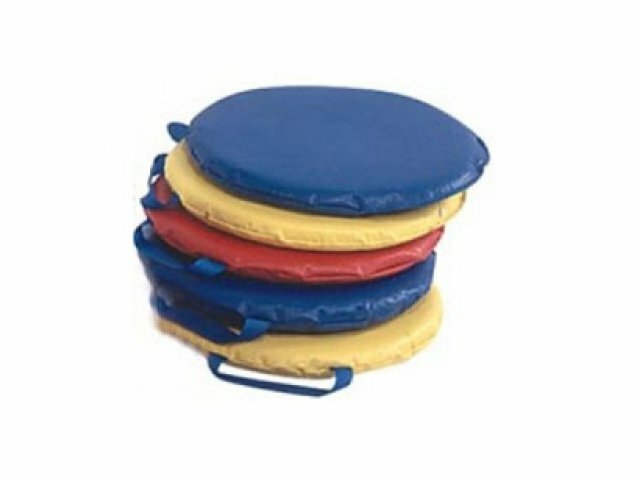 Sit Arounds Kids Floor Cushions are perfect for preschoolers. Their attractive circular shape is great for sitting. Vinyl Kids Floor Cushions are perfect for circle time, free play and center time. Little ones will just love their cushy padding and vibrant colors. With individual floor cushions for kids, every child can have a clear personal space. They make sitting on the floor much more comfortable so young learners will be able to focus longer and enjoy more. These kids floor cushions are low-maintenance, cozy and easy to arrange. Their easy-clean, tear-resistant, nylon-reinforced vinyl upholstery covers 1”-thick foam padding. A built-in handle enables children to move around the cushions and arrange them independently. With enticing colors that look great in a classroom, these floor cushions for kids are sure to make an excellent addition to any early-childhood learning space. Durable Upholstery: Nylon-reinforced vinyl exterior is cleanable with a bleach and water solution and is highly resistant to tearing. Convenient Design: Built-in handle for easier carrying. 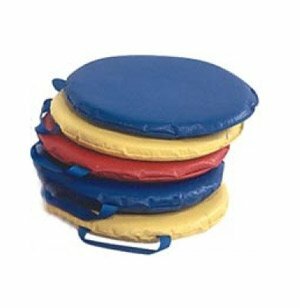 Colorful Collection: Includes 2 red, 2 yellow and 2 blue, 1"-thick foam cushions. Great Options: Choose from 12"-square Sit Upons or 12"-diameter Sit Arounds.